The Salone del Mobile in Milan has become by now a fundamental annual step for Lithos Design. Because in this occasion, we present to the public a new collection of stone design coverings, that will become part of the product family composing Lithos Design catalogue. And every collection is the result of long and exhausting work, made through the preceding months or even years. A work built up through intuitions, plans, trials and errors, prototypes, constant improvements and even unexpected surprises (as regards this last project ‘Le Pietre Luminose’, for instance, the translucency of Carrara marble was a real surprise, no one could imagine such a result!). This is why – I mean, as I experience first-hand the whole process of new products creation, from conception, to development, to their final realization – I think this is the reason why the opening day of the Salone del Mobile is for me one of the two most important moments of the event. Because every year, the day the fair opens when I see the booth early in the morning showing for the first time a complete new line of stone design products, that moment is always unique and unrepeatable to me, intense and deeply emotional, a single moment able to reward me for all the effort. And there’s a second, crucial step, which has become paramount to me: waiting for someone unknown to pass by the booth, stop, and approach me to tell me about the amazement and the Emotion he’s or she’s feeling looking at the product. It happened also this year, more than once, and for me the goal was reached. Again. Because if our products are able to be not only textural, but also emotional, it means we did it right, it means the product has a soul of its own. 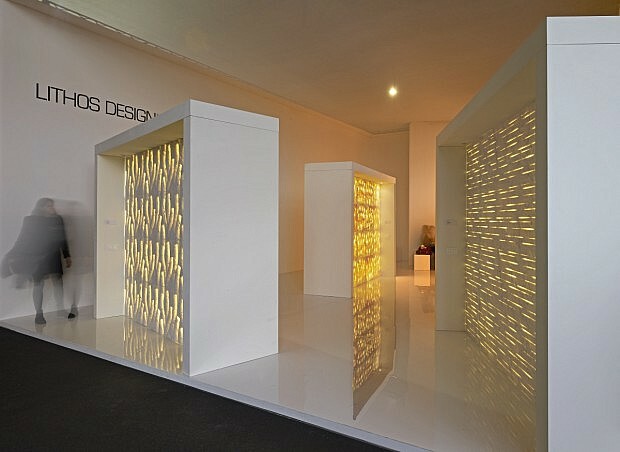 Because all in all, for Lithos Design, Emotion is maybe a key factor. And this results in a strong charge of positivity and enthusiasm, also for our staff and partners. I like to think that this same Emotion, this same enthusiasm may be conveyed someway to any living setting where this product may eventually be laid.